IntelliMagic Vision uncovers hidden risks and potential bottlenecks inside your environment before they can impact production. IntelliMagic Vision provides a single pane of glass for monitoring the health of your entire SAN / NAS infrastructure including IBM storage systems. Monitoring for multi-vendor storage arrays from IBM, NetApp, Dell EMC, Infinidat, and others. When you use IntelliMagic Vision, the hidden risks and potential bottlenecks inside your environment are uncovered even before they can impact production, through intelligent dashboards that contain thousands of measurements condensed into an easy-to-read rated visualization. For virtualized environments, the IntelliMagic Vision dashboards show both the SVC or Storwize Virtualization layer and the underlying storage systems with their internal components. 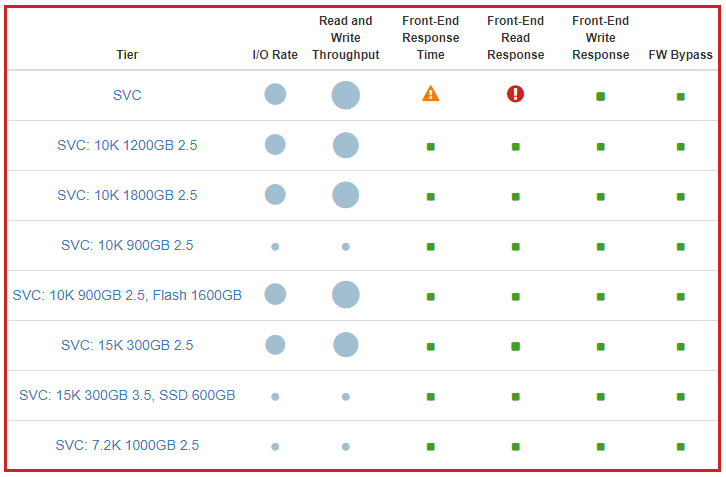 Screenshot of one of the SVC Dashboards from the IntelliMagic Vision Web Reporter, showing front-end performance issues. Most solutions are either really strong on VMware support, fabric support, or storage support. IntelliMagic Vision is different. IntelliMagic Vision collects performance and configuration information on the VMware, fabric and storage systems to provide a complete and end-to-end picture. On top of that, IntelliMagic provides integrated topology visualization and automatically correlates and embeds the configuration relationships in the user interface. Pharmapartners is an IT service provider in the healthcare industry and uses IntelliMagic Vision to ensure reliability of their Storwize environment. IntelliMagic Vision helps us maintain insight into what goes on inside our storage layer. The great thing is that all dashboards have drill downs all the way down to the component level, which uncovers potential internal bottlenecks. Read more about how IntelliMagic Vision is used at PharmaPartners. Schaeffler, a large manufacturer of precision instruments for ‘anything that moves’, uses IntelliMagic Vision to protect their virtualized SVC environment from hidden risks. Proactive monitoring of any bottlenecks that may arise is indispensable. With IntelliMagic Vision, potential problems are discovered early, analyzed and prevented from developing any further. Read more about how IntelliMagc Vision benefits Schaeffler. IBM Spectrum Virtualize software virtualizes storage arrays, giving you a single point of control to manage your SAN storage environment. Spectrum Virtualize software runs on a variety of IBM hardware including SAN Volume Controller (SVC), Storwize V7000, V5000 and V3500, and FlashSystem V9000.